Welcome once again to Monthly Marvel Muster… or bi-monthly Marvel Muster, as the case may be. My November was a trash fire, but I’m back now with two months of Marvel news and reviews all at once [Thank goodness! —Ed.]. A lot happened in the last two months. Marvel Legacy is now in full swing, inspiring new plot lines in almost every ongoing book. Charles Xavier is returning from the dead. Tony Stark appears to have woken from his coma and then gone missing. Steve Rogers and Sam Wilson are both finally free of the blight that is Nick Spencer and have new solo series. Wilson Fisk is now the mayor of New York City. Loki is suddenly the Sorcerer Supreme. Really, it’s just a lot. October and November brought three new ongoing series: Captain America by the team of Mark Waid and Chris Samnee, Falcon by the mostly-new-to-Marvel team of Rodney Barnes and Joshua Cassara, and a new run of Moon Knight by Max Bemis and Jacen Burrows. In addition, four new mini-series began in October. Declan Shalvey and Mike Henderson take on a team-up of two popular characters in Deadpool Vs. Old Man Logan. Garth Ennis returns to the Punisher with Punisher: The Platoon with art by Goran Parlov. Spirits of Vengeance by Victor Gischler and David Baldeon is a supernatural team-up series starring the original Ghost Rider, Johnny Blaze. And Marvel’s Black Panther Prelude by Will Corona Pilgrim and Annapaola Martello is their latest Marvel Cinematic Universe tie-in/prequel. 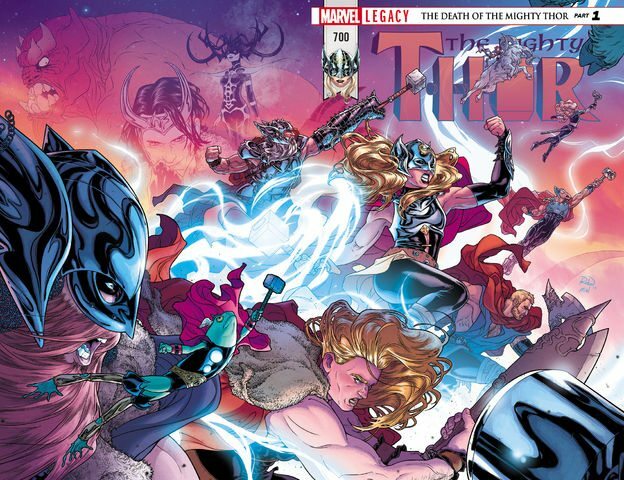 Marvel put out one one-shot in October: Thor: Where Walk The Frost Giants by Ralph Macchio and Todd Nauck, which I sort of assumed would have some thematic connection to the newest Thor movie considering the timing of its release, but apparently does not. November’s one-shots were more interesting. As part of Marvel Legacy, Marvel put out five one-shots numbered as continuations of long-ended series: early 90s series Silver Sable and the Wild Pack, and Darkhawk, 80s series Master of Kung Fu, and Power Pack, and satirical 60s series Not Brand Echh. 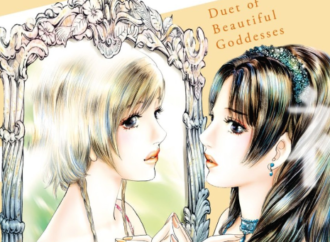 It’s completely unclear whether these one-shots are meant to be a way to gauge interest in potential new ongoings, teases for upcoming storylines and appearances in other books, or just nostalgia trips for long-time fans. Only one ongoing series ended in October and November, my beloved U.S. Avengers. 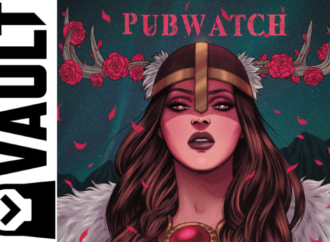 Al Ewing and Paco Diaz end the series with a two-part storyline that’s both an homage to classic Archie Comics and a commentary on comics fandom and the pushback against changes to long-running characters and properties. Ewing managed to write a pointed critique without sounding either strident or judgmental. Marvel is consolidating their three current Avengers series into one weekly book for a big four-month-long storyline starting in January, and it’s still unknown what the Avengers titles will look like once that’s over. Comics being comics, I doubt this title or one with a similar cast and creative team will be back, but I live in hope. According to Marvel Marvel Legacy “will usher in the dramatic return of dozens of its most beloved heroes, villains, teams and artifacts in bold stories that will begin the next chapter of the Marvel Universe,” and that “[a] return to original series numbering will serve as a rallying cry for old fans, and a dynamic new trade dress will signal a clean jumping-on point for new readers,” but as a fairly savvy and knowledgeable Marvel reader I’ve mostly just found the entire Marvel initiative confusing and unformed. The “dramatic return of dozens of its most beloved heroes, villains, teams and artifacts” is such a broad descriptor that it can be applied to just about any story. Old Black Panther villain Ulysses Klaw returns to Wakanda? Marvel Legacy. Tony Stark wakes from his coma? Marvel Legacy. Bobby Drake hangs out with some of his old teammates from the Champions for a couple issues? Marvel Legacy. The Defenders fight the villains trying to fill the power-gap left by the Kingpin supposedly going straight? Marvel Legacy. Carol Danvers chases an infinity stone into a mirror universe? Marvel Legacy. Danny Rand teams up with Sabretooth? Marvel Legacy. It’s not that none of these stories fit the parameters set out for a Marvel Legacy story: it’s that if all these stories fit, your parameters may be too wide. Meanwhile, the “return to original series numbering” is less a rallying cry for old fans and more an obstacle course for new and old fans alike. Some but not all series are getting renumbered, and while in some cases the new numbering is the clear beginning of a new storyline, in others it seems completely arbitrary. Peter Parker: The Spectacular Spider-Man #6 and #297 both came out in November and are part of the same storyline. The last scene from issue #6 is the first scene of issue #297. 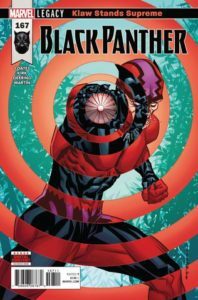 Ta-Nehisi Coates is plotting long-arc stories on Black Panther, and September’s Black Panther #18 is the midpoint of a story that continues directly in October’s Black Panther #166. For added confusion, some books are getting both new numbers and new names. 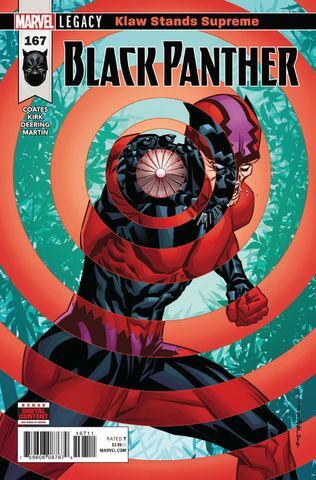 Deadpool #36 is followed by Despicable Deadpool #287. Totally Awesome Hulk #23 leads into Incredible Hulk #709. Jennifer Walters goes from Hulk #11 to She-Hulk #159. It all feels needlessly confusing and just as difficult to follow as Marvel’s previous policy of putting out a new issue #1 every thirty seconds. Marvel Legacy is producing some great stories though. My current favourite is in All-New Wolverine. 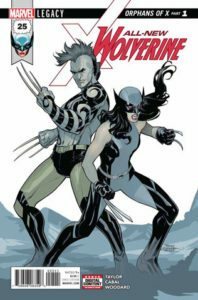 Tom Taylor and Juann Cabal’s All-New Wolverine stars Laura Kinney and her clone-“sister” Gabby and I think it’s one of the best books Marvel is currently putting out. Even when the storylines are violent and/or dark, which is often since this is Laura Kinney’s life after all, the book remains consistently hopeful, with a powerful found family narrative and great touches of surreal humour. The “Orphans Of X” storyline has Laura and Gabby teaming up with Daken to fight a mysterious group who are attempting to kill all of them. This group, who call themselves the Orphans of X, turn out to be a coalition of family members of people killed by Wolverine and his various clones and offspring. Because sometimes a character’s “legacy” is one of death and destruction. And sometimes you have to face that legacy head-on. After alienating a significant portion of their audience with the Nick Spencer story of Steve Rogers, secret Hydra agent, Marvel has given the task of rehabilitating the character to the team of Mark Waid and Chris Samnee, who previously worked together on a critically acclaimed run of Daredevil, for which they both won Eisner Awards, and on a short run of Black Widow. Their thesis seems to be that they’re the anti-Nick Spencers, leaving behind epic universe-defining plots for smaller, more personal stories. 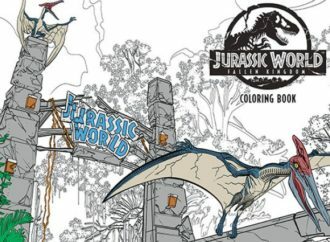 The art is clean and a little retro feeling, and Matthew Wilson’s colors are almost sepia-tinged. 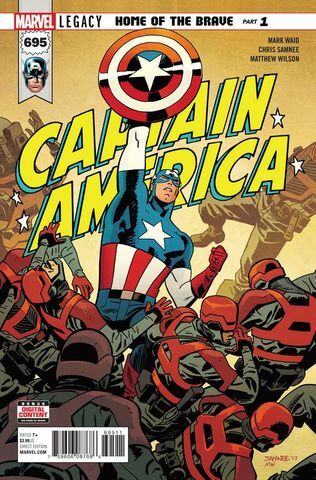 The plot of their first issue (#695, because legacy numbering) involves Steve literally saving small children from white supremacists in small-town Nebraska, and then returning to the same small town ten years later to punch the same white supremacists, but only after listening to a bunch of testimonies about how great and inspiring he is. Subtle, it is not. But it is a much-needed fresh start for the character, and for all its predictability and lack of subtlety it manages to actually be a pretty charming first issue. I’m cautious, but hopeful. The first arc of Charles Soule’s Astonishing X-Men reveals that Charles Xavier, who was killed in 2012’s Avengers vs. X-Men event, has somehow survived psychically and been fighting classic X-Men villain the Shadow King in the astral plane. It’s all very comic book. As of October’s Astonishing X-Men #4, at least some of the rest of the cast know that Professor X is pulling some of the strings on the astral plane and fighting on their side. He’s still a psychic ghost right now, but solicitations for the series suggest that Xavier will be back physically as well by January’s issue #7. Brian Michael Bendis is leaving Marvel, but first he’s wrapping up his runs on the fifty million books he’s writing. In Invincible Iron Man that means bringing back Tony Stark, who’s been in a coma since the end of Civil War II. 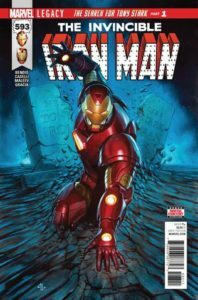 October’s Invincible Iron Man #593 begins “The Search For Tony Stark.” Tony’s body has disappeared from the secure facility in which he was being kept. 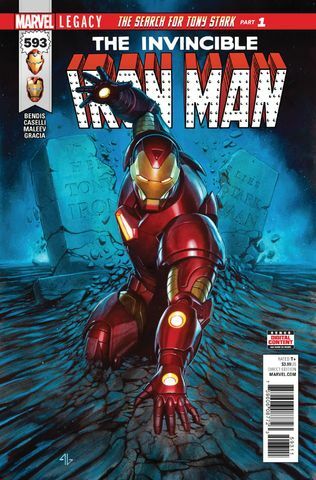 The current entirely-female cast comprised of Riri Williams, aka the young hero Ironheart, Pepper Potts, Mary Jane Watson, Tony’s newly-revealed birth-mother Amanda Armstrong and Tony’s AI Friday are all searching for him, while attempting to prevent a hostile takeover by the Stark Industries Board of Directors. They are theoretically eventually going to be joined by the Victor Von Doom, aka the Infamous Iron Man, but two issues into the storyline he’s still caught up dealing with his own problems. Bendis’s Iron Man run has been a lot of fun, and I really appreciate it’s primarily-female cast. It’s inevitable when a new writer comes onto a book that the cast and focus to change significantly; I can only hope that whoever follows Bendis keeps at least some of what he’s built here. If I were cynical, I might suggest that Marvel’s new commitment to returning to original numbering might have something to do with the fact that that leaves many of their most popular characters about to reach big milestone issues. But of course I’m not cynical. Whatever the reasoning, the numbering on The Mighty Thor reverted just in time for a big issue #700, a sprawling 50-page epic by Jason Aaron and a long list of artists that attempts to draw connections between a plethora of past and future Thor plots and characters, everyone from a young Thor Odinson, to Throg Frog of Thunder, to Jane Foster, to the ancient King Thor and his granddaughters in the far future. Also there’s the Mangog intent on destroying Asgard, the Dark Elf Malekith killing the Norns who weave the fate of Asgard and Jane Foster fighting Jen Walters (Hulk/She-Hulk) for reasons that are unclear. 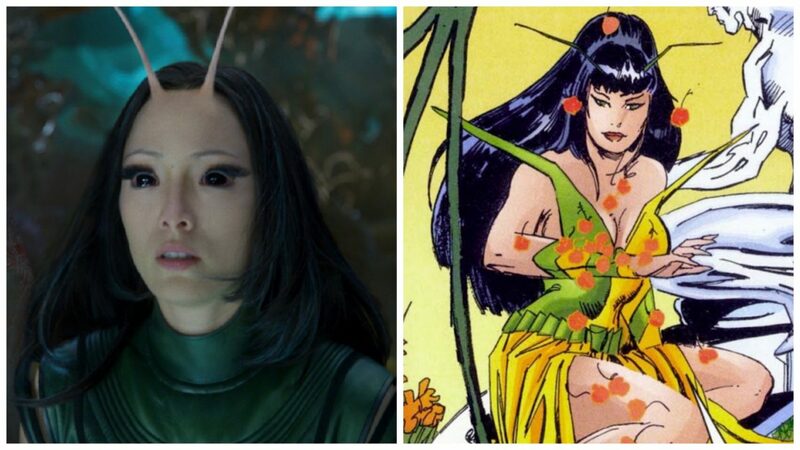 Also, apparently Hela’s hanging out with Thanos now and she too is plotting the downfall of Asgard. There’s a lot going on, but it’s actually a relatively cohesive narrative for being so scattered. Relative is the key word though, and it tosses out a lot more questions than it suggests answers, which is actually a good descriptor of what the entirety of Jason Aaron’s run on the title has become. The longer Aaron’s run goes on and the more complicated and epic and interconnected the entire storyline gets, the less confident I become that he’ll actually manage to pull the whole thing off. 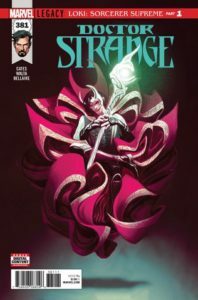 New creative team Donny Cates and Gabriel Hernandez Walker open their run on Doctor Strange with the reveal that Loki is now the Sorcerer Supreme. Loki is ensconced in the Sanctum Sanctorum, Stephen Strange’s apprentice Velma Stanton — a highlight of Jason Aaron’s run on the title, who I’m glad to see stick around — is now working for him, none of the other magic users in New York trust him, and Stephen Strange is apparently not using magic at all and working as a veterinarian. It’s a first issue, so it’s all a lot of questions and only hints at answers, but I admit to being a bit dubious about where this is all going, and I don’t much care for the art. Also, this is apparently a Marvel Legacy story? So far it manages to not fit any of the remarkably vague criteria for such. Back in 2012, Marvel built an entire line-wide event out of the possible return of the Phoenix Force to earth, with the Avengers and the X-Men going to war over who gets to control/protect the expected Phoenix host Hope Summers. Avengers vs. X-Men was honestly really, really dumb. 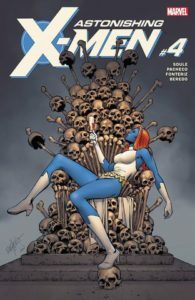 It was convoluted and contrived in the way line-wide events can be at their worst, and it put a nail in the coffin of an interesting and innovative era of X-Men stories that I still miss. Now the Phoenix Force is apparently returning to earth again, and yet somehow this time nobody but the young Jean Grey has noticed? 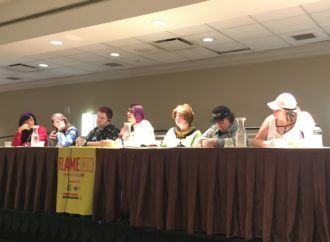 So, the same story concept that required a universe-spanning epic five years ago is now playing out in the pages of a single ongoing with modest sales numbers. The difference is rather glaring. For one thing, this time around it’s a better story, because the characters with actual first-hand experience with the Phoenix Force are driving the plot, rather than everyone and their brother reacting to a perceived threat by…not consulting the people who’ve dealt with said threat before. 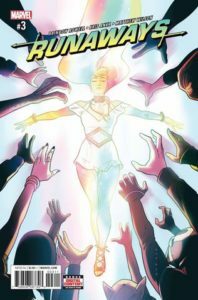 Jean Grey #9 ends with young Jean, the maybe-psychic ghost of older Jean (this is still unclear), Emma Frost, Hope Summers, Quentin Quire and the remaining Stepford Cuckoos all facing off against a newly-arrived Phoenix Force in the woods outside Westchester, NY, the former home of the X-Men. 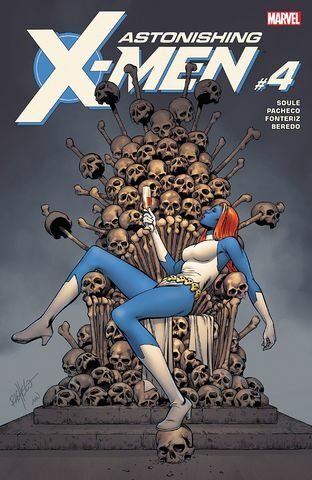 It’s all apparently leading into the resurrection of the adult Jean Grey, who’s been dead or ascended to another plane of existence or something since 2005, a lifetime in superhero comics where well-known characters rarely stay dead for more than a handful of years. It was revealed at the end of October’s Daredevil #28 that Wilson Fisk, aka the crime boss Kingpin, has been elected mayor of New York City. Because in the Marvel comics universe New York City voters are apparently really gullible and easily swayed by anti-superhero rhetoric. These are after all the same voters who elected J. Jonah Jameson as mayor on the back of his years of anti-Spider-Man ravings. Matt Murdock is, as you can imagine, not impressed by this turn of events. Neither are any of NYC’s other street-level heroes. 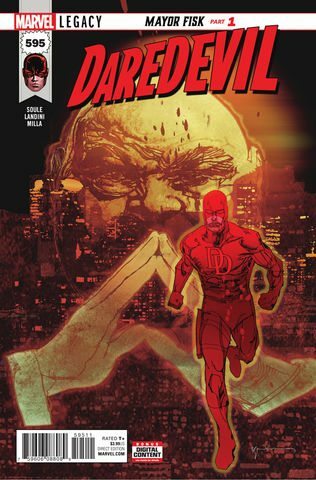 So far the Mayor Fisk storyline is primarily playing out in the pages of Daredevil, and in Defenders where the titular hero team is battling the various villains attempting to replace Wilson Fisk as crime lord of New York. Since its earliest appearances, the Kingdom of Wakanda has been presented as a pinnacle of technological achievement and something of a utopia for its citizens. An idealized idea of an Africa without colonization. A peaceful, isolationist nation ruled by benevolent monarchs. Ta-Nehisi Coates has been dismantling that idyllic fantasy image issue by issue, piece by piece, to reveal a much more complex and nuanced reality. An isolationist nation is always going to have problems on its borders. A people ruled by a monarchy will never be free, no matter how benevolent or heroic or anointed by the gods those monarchs may be. And no nation is free of the legacy of colonialism. The violent subjugation of the weak by the strong is a story as old as human civilization. it’s endemic in human society. You can’t escape its effects, you can only hide from the knowledge of it. Coates is writing long-arc comics, and each arc builds on the last, adding layers of history and context and meaning. He’s asking complicated questions about legacy and nationhood and divine power, and he’s not shying away from the complicated and sometimes unpleasant answers. Leonard Kirk’s art is stunning, but it is particularly elevated by Deering’s inks and Martin and Milla’s colors. 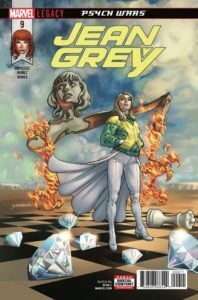 It’s full of rich colors and deep, inky shadows that highlight the emotional intensity in a low-action issue that’s mostly just a series of increasingly difficult conversations. I adore this book so much. Every month it’s such a joy, but I love this issue even more than the rest because it teams Kate Bishop up with two of my other favourite younger heroes, Laura Kinney and her clone-sister Gabby. Laura and Gabby are in L.A. following a lead on a case they’re looking into. Kate is following her own lead, and it turns out they both lead to the same place. So, they get to beat people up together. What better basis for a superheroic friendship? Kate and Laura and Gabby make a great team, and Thompson writes Laura and Gabby well. Their dialogue with Kate is delicious, with just the right level of tension quickly sliding into tightly attuned banter. And for all they are rather bemused by each other’s styles, Laura and Kate fight well together. Walsh’s art makes all the characters look great, while highlighting their distinct looks and fighting styles. 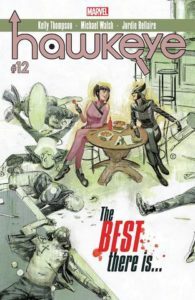 It’s just a great one-shot, and it’s a good setup for the next arc, ending with a certain other hero named Hawkeye showing up on Kate’s doorstep. Squirrel Girl is one of the most consistent comics I’m reading right now. Every issue is incredibly solid, not every storyline is brilliant, but it’s reliably good. It’s smart and funny and heartfelt and goodhearted and just wonderfully hopeful. North, Henderson and their plethora of guest artists completely outdid themselves on this issue. 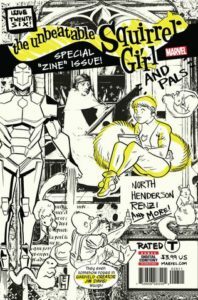 It’s billed as a special “zine” issue, made up of ten short comics of between one and four pages, presented as having been written by Marvel characters. 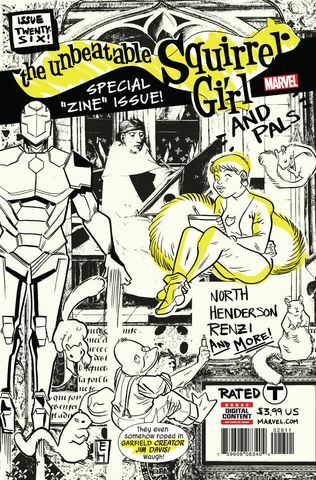 It’s a fun mix of Squirrel Girl regulars and more popular characters. Other than the first story, a noir take on Howard the Duck by Erica Henderson (with great Chip Zdarsky art), all the stories are written by North. Keeping one writer was a smart move as it gives the issue a cohesive voice and allows the different artists to shine. The stories are all good, but there are a couple real standouts. 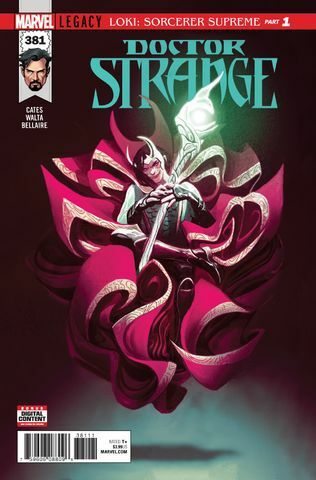 My favourite is the “Loki Comic” with art by Carla Speed McNeil, which is written in a spiral meant to read differently depending on whether you start on the outside or the inside of the spiral, and is honestly possibly the most accurate Loki characterization in the comics in years. The other hightlight is definitely the completely ridiculous “Galactus Comic” which is a Garfield fusion with art by Garfield cartoonist Jim Davis. What happens when you’ve moved on from your past, but your past hasn’t moved on from you? Three issues in, Rowell and Anka are still re-assembling their team. In the first issue, Chase arrives at Nico’s apartment with a dying Gert in his arms, having stolen a time machine and gone back in time to try and save her life. Gert’s immediate response after her resurrection is horror. Horror that the Runaways have fallen apart, that they’re not still a team, not still a family. And so Chase and Nico and Gert (and Old Lace) go to reassemble their family. It seems entirely reasonable to Gert that they’ll have no problem putting the family back together. Chase and Nico are both miserably unhappy, reuniting with a newly-alive Gert is a clear good thing in their lives. But it’s not so clear-cut for everybody. Unlike Chase and Nico, Karolina is happy. She’s in college, she has friends, she has a girlfriend, she has a life. She’s happy. And when they come to ask her to run away with them again, she says no. The heart of this issue is two gut-wrenching conversations. The first between Nico and Karolina, the second between Chase and Gert. Nico and Karolina have a complicated history, and now they’ve ended up so far away from each other that they might as well be on different worlds. Without the Runaways, Karolina has everything. Without the Runaways, Nico has nothing. The last page of their conversation, when Nico leaves Karolina alone in her dorm room, just breaks my heart. Meanwhile Gert is dealing with the realization that the people she loved are gone. Her friends have grown up without her and she’s still a teenager. As she says to Chase, “you came back for me. But you didn’t wait for me.” It’s a touching and ultimately hopeful scene as they slowly start to define what their relationship is to each other now. 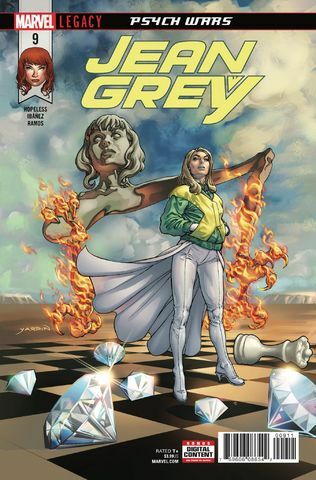 Anka is one of my favourite artists working in comics today, and this book plays very much to his strengths. The smallest details of clothing, of facial expression and of body language add depth and nuance to every scene. Since first appearing in The Amazing Spider-Man #1, J. Jonah Jameson’s life has been firmly linked to that of Peter Parker. An otherwise reasonable man, he hates vigilante heroes in general and Spider-Man in particular. For years he was Peter Parker’s boss at the Daily Bugle, employing Peter Parker while railing against his alter-ego. That tension in their relationship has driven decades of stories, some great and some terrible. That tension was resolved once, when Peter unmasked during the original Civil War storyline, but that reveal was retconned out of existence only a few years later. Down on his luck and increasingly unhinged, Jameson is reduced to running a blog called threatsandmenaces.com. 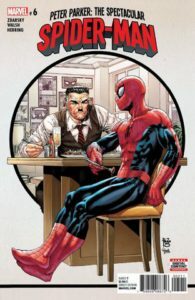 For reasons that don’t need exploring at this juncture Spider-Man agrees to a one-on-one interview with Jameson in exchange for some information he needs that Jameson has. And that’s the entire issue. J. Jonah Jameson and Peter Parker sit down in Jameson’s apartment and they talk. They hash it all out. The anger, the resentment, the bad blood, all the choices they’ve made while orbiting around each other for all these years. 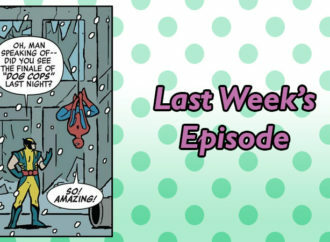 And in the end Jameson — his family gone, his career in tatters — is faced with the realization that his vendetta against Spider-Man is all he has left, and it breaks him. 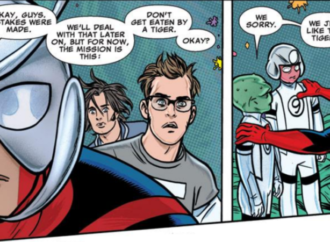 But here’s why Peter Parker is a hero: it breaks him too. Faced with J. Jonah Jameson at his lowest and most defeated, Peter chooses to do the only thing he can. He takes off his mask. It’s shocking and unexpected, a huge change of status quo for the characters, and it is handled brilliantly with sharp, intelligent writing and beautiful art. One of the strongest single issues I’ve read in a long time. 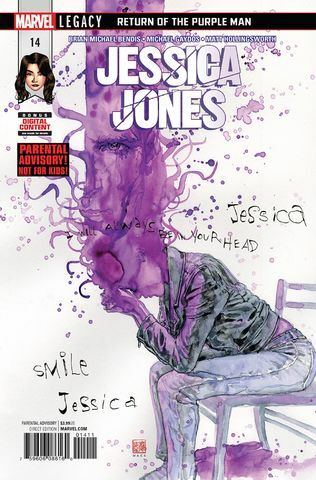 When I saw that the latest storyline for Jessica Jones would be the return of the Purple Man, I groaned and winced. The original storyline in Alias wraps up that part of Jessica’s story so perfectly, I couldn’t see how there was any point in rehashing it. It felt like a regression. I was worried it would destroy all changes Jessica has gone through in the last decade of comics, all the ways she’s grown as a character since the Purple Man’s defeat. I am very happy to have been proven wrong. This time it is different, and Bendis knows it and Jessica Jones knows it too. This time Jessica knows how to ask for help, knows who her allies are and what their strengths are. This time she has a plan, and she tells Carol Danvers as much. Because of course, if you’re Jessica Jones, that’s exactly what you’ve been doing. Because she isn’t the same reactive, distrustful, alcoholic mess she was the last time she faced Killgrave. She has genuinely changed and grown and become a better, smarter hero, and she’s about to show us how. I’m looking forward to it.